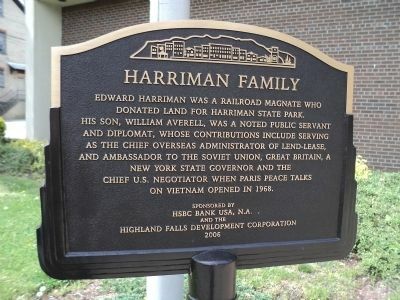 Edward Harriman was a railroad magnate who donated land for Harriman State Park. His son, William Averell, was a noted public servant and diplomat, whose contributions include serving as the chief overseas administrator of lend-lease, and Ambassador to the Soviet Union, Great Britain, a New York Governor and the Chief U.S. negotiator when Paris Peace talks on Vietnam opened in 1968. 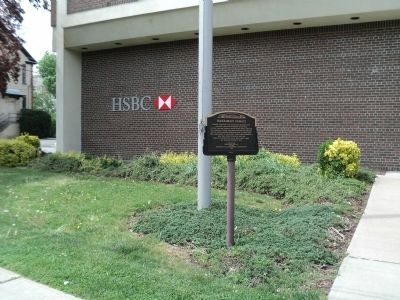 Erected 2006 by HSBC Bank USA, N.A and the Highland Falls Development Corporation. Location. 41° 21.963′ N, 73° 57.952′ W. Marker is in Highland Falls, New York, in Orange County. Marker is at the intersection of Main Street and Dale Avenue, on the right when traveling south on Main Street. Touch for map. 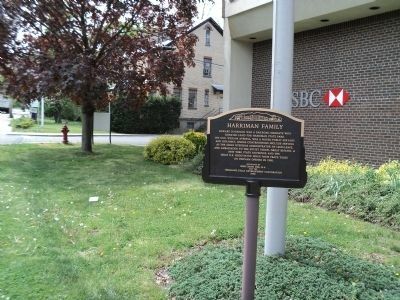 Marker is located in front of the HSBC Bank. Marker is in this post office area: Highland Falls NY 10928, United States of America. Touch for directions. (within shouting distance of this marker); John Burroughs (approx. 0.2 miles away); Highlands World War I Memorial (approx. 0.2 miles away); Freedom Road (approx. 0.2 miles away); Highlands War Memorial (approx. 0.2 miles away); Highland Falls World War II Memorial (approx. 0.2 miles away). Touch for a list and map of all markers in Highland Falls. More. Search the internet for Harriman Family. Credits. This page was last revised on June 16, 2016. This page originally submitted on April 25, 2012, by Bill Coughlin of North Arlington, New Jersey. This page has been viewed 371 times since then and 9 times this year. Photos: 1, 2, 3. submitted on April 25, 2012, by Bill Coughlin of North Arlington, New Jersey.